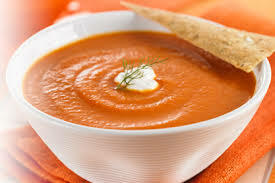 Soup has many admirable qualities – it’s nutritious, inexpensive, unpretentious, comforting, and very flexible. That last one – flexibility — is what I want to talk about today. Some of you have heard me say this before: Soup is a busy cook’s friend. If you don’t have something the recipe calls for, use something else instead, something reasonably similar if possible. If the recipe calls for something you don’t like, for heaven’s sake just leave it out. Soup is also a marvelous way to create something delicious out of bits and pieces of leftovers combined with a few strategic items from your pantry. That’s what I call ad-libbing: open the refrigerator, see what you have, then imagine how you could combine it with what else you have. A friend of mine occasionally makes what she calls whatcha-got stew. Same idea. Here are three real-life examples. Using l eftover salsa. The other day I made some taco soup. You know this one: sautéed ground beef, onions, garlic; canned beans (drained), canned corn (drained) and canned diced tomatoes (not drained); beef or chicken or vegetarian stock (your favorite commercial version); seasonings. Then at the last minute I spied a half-full container of store-bought tomato salsa. When the soup was ready, spiced up to my taste with cumin, chili powder, salt, and pepper, I stirred in that salsa just before serving. It added a deeper flavor to the soup overall, and the veggies in the salsa retained their crispness, which was a nice contrast to the smoothness of the soup. Using leftover sour cream. Over the weekend, when the weather seemed to call for something hot for lunch, I made a batch of carrot soup. It’s one of the most nutritious things you can make (you know how good carrots are for you) and also inexpensive, and besides carrots keep very well in the fridge for a long time. I have three solid recipes, but I was yearning for the one with oranges and fresh ginger; it’s delicious and just a bit exotic. Then, a quick peek in the fridge showed me a half-full container of low-fat sour cream, and I folded that in. 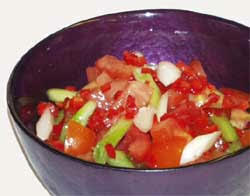 That created two changes: it softens the color, and adds a new layer of flavor, slightly tangy. It’s a good complement to the sweetness of the carrots.